100% HUMAN HAIR Add on bangs / fringes. Similar to ones seen on The Tyra Banks Show and in Glamour and Style magazines. Compare to BangTox, EasiBangs, Baby Bangs, Sultryhair. Some colors (+5) are $5 extra. It can be tinted, toned or streaked with a DARKER color by your hairdresser, but you cannot lighten it. Model is wearing one bang that has been trimmed. You will get one piece 6" long that you will need to have trimmed to fit your face. 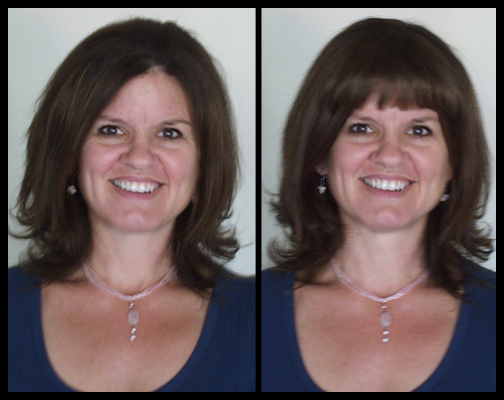 Use two side by side for wider bangs. The width of the bangs is about 2 1/2 at the smallest area at the top to 4 or so inches at the bottom, it depends on how much you fan them out. Unsnap clip by bending edges back. Slide onto hair. You may also backcomb the hair prior which will add a better base for the clip to hold. Bend clip to secure in place. See example instructions. Sold separately. No returns allowed on human hair products.